Topics: Domain Name Management, Brand Monitoring And Protection, Domain Name Recoveries, Global Cctld Registration, and Gtld Expertise. Advertisinglaw.co.uk's IP address is 212.53.89.138. It is hosted by Unix Web Hosting Block 12 (England, London,) using Apache/2 web server. 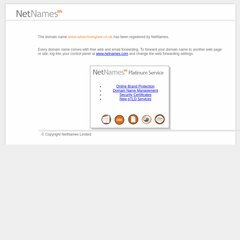 Its 2 nameservers are ns1.netnames.net, and ns2.netnames.net.